1. To foresee or to forewarn. 2. 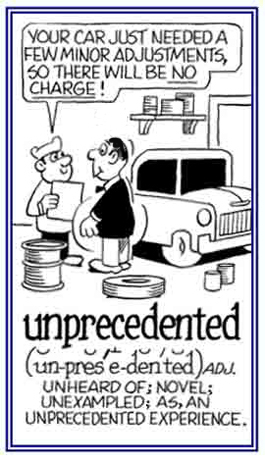 Etymology: from Latin praevisus, past participle of praevidere, "to foresee"; from pre-, "before" + videre, "to see". 1. A reference to a matter or circumstance that has no earlier parallel or equivalent: One terrible feature of the Holocaust was the unprecedented genocide of millions of people in the "death camps" of Germany. 2. Relating to something that has never been seen, done, or experienced before: The unprecedented decision that the Jackson family made was to go on vacation in the Alps, a place they had never visited previously. 3. Descriptive of the greatest in size, amount, degree, etc. that has ever been known: According to the news, the flood waters in some countries have risen to unprecedented levels. 4. 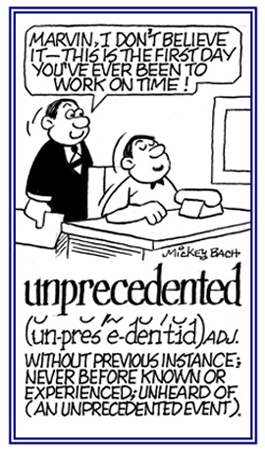 Etymology: un-, "not" + precedent, "experienced" + -ed, "past tense". © ALL rights are reserved. 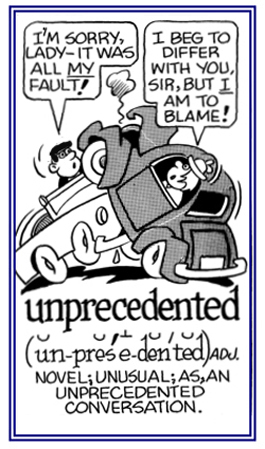 Showing page 19 out of 19 pages of 275 main-word entries or main-word-entry groups.